I promise this is the last FPS I’ll review on this blog for at least a month. Even though it’s only the second game I’ve played to do it, Shadow Warrior is still proof that including Stan Bush’s The Touch as what you think is a knowing wink to the ‘80s generation (i.e. your target audience) is already a cliché. Thankfully this reboot of the “classic” 1997 shooter knows its business – mostly, anyway – and so the only time you hear The Touch is during a short segment in Shadow Warrior’s opening cutscene to establish both the character of its protagonist, Lo Wang, and the tone of the game as a whole. 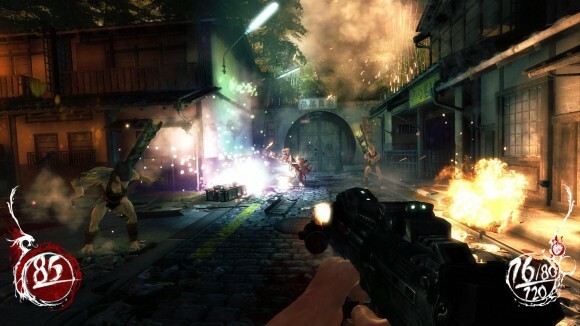 Shadow Warrior isn’t so much a throwback to 90s shooters as it is an attempt to imagine what the genre might have been like if Halo and Call of Duty had never happened; while its link to the past is never less than obvious it also manages to avoid the pitfall of being fully retro for the sake of it, and instead includes a whole host of original features and modern quality-of-life improvements that ensure it stands on its own two feet. And what is more, it does so remarkably well. Shadow Warrior goes down the same fun-over-realism road that Bulletstorm tried to travel several years ago, except this time it actually gets to the end rather than only partially committing to the concept and careening off that road halfway. Said road isn’t without its bumps and potholes, and Shadow Warrior isn’t immune to falling foul of them, but what’s here is very fun indeed. You are Lo Wang, corporate assassin for hire. You drive a fast car. You’re a master of the katana. You have a mansion with a secret underground lair. You are, in fact, a massive walking cliché (part of the reason The Touch is so ironically appropriate), but that’s only on the surface; very soon after the game starts Lo Wang is bonded with a demon called Hoji who mercilessly skewers Lo Wang at every single opportunity with his ongoing sardonic commentary. This is how Shadow Warrior signals its knowingly humourous brand of ultraviolence; in terms of tone it’s just as crude and shallow as its predecessor, but thanks to Hoji it can at least be self-consciously crude and shallow and take the piss out of itself. Not that Hoji gets to have all the fun, since Lo Wang gives as good as he gets and their constant mutual needling put me in mind of a buddy cop movie at times – at least, if there were a buddy cop movie about a demon invasion from another dimension. 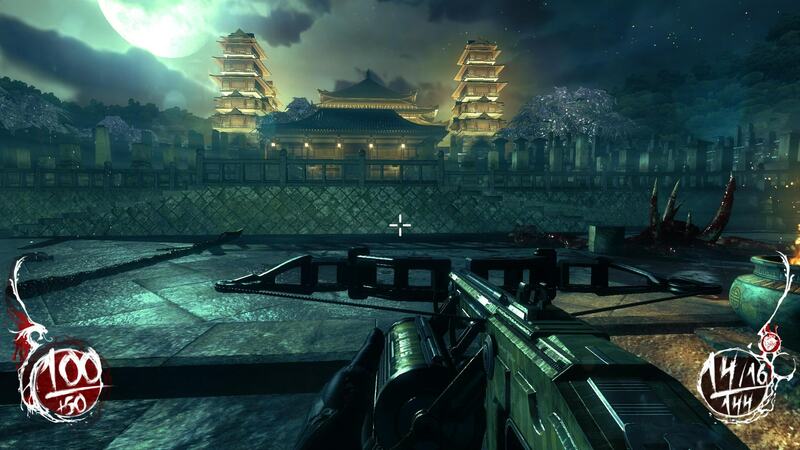 Shadow Warrior’s plot is as thin as the walls of the various pagodas dotting the opening levels of the game. Lo Wang is sent to retrieve a magical katana for his corporate paymaster, Zilla, but all hell literally breaks loose during the attempt and understandably throws a bit of wrench into Lo Wang’s day, and so he spends the entire length of the game trying to assemble the various pieces of this macguffin katana and halt the demonic incursion. In other words: there are demons, and it’s Lo Wang’s job to kill them, which is exactly as complicated as the plot of a game like Shadow Warrior needs to be. Oh, it tries to go a bit further with animated cutscenes and a “tragic” backstory but these end up being somewhat at odds with the rest of the game, so it’s a good thing it can get away with the plot falling flat on its face due to the nature of what that gameplay is. As previously mentioned, said gameplay involves killing demons. A lot of demons. There’s two or three occasions past the start of the game where you fight human enemies, but they’re pretty much thrown in just to contrast Shadow Warrior with more mainstream shooters because they’re rather dull to fight; the meat of the game is chopping up a variety of demons with your katana, and as far as mechanics and design go I think Shadow Warrior is one of the most polished examples of the genre I’ve seen. Lo Wang gets his sword along with seven or eight guns, and all of them remain useful in different situations throughout the game1. Meanwhile there’s a dozen-odd types of demon ranging from basic run-up-and-slash-at-you cannon fodder to miniboss material, and all of them remain moderately threatening throughout the game thanks to an enrage mechanic where surviving demons will power up as you carve your way through their buddies. Picking the right gun for the right enemy at the right range is key to surviving some of Shadow Warrior’s more frenetic battles, and so it’s already somewhat more cerebral than the average two-gun FPS despite its seemingly shallow appearance. 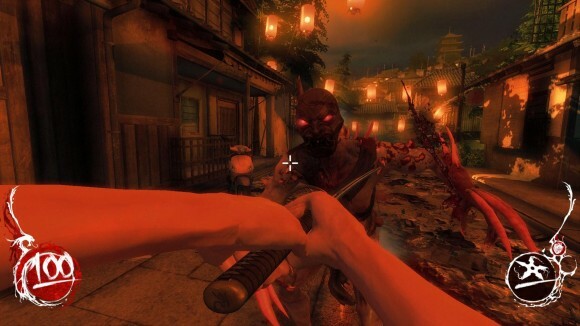 But as well executed as Shadow Warrior’s gunplay is it is put in the shade by its implementation of melee combat, which is the best I’ve played since Dark Messiah. What gets me about it is that it’s so simple. Lo Wang gets light and heavy attacks with his katana – activated by the left and right mouse buttons respectively – but these are only used when you’re trying to herd a group of enemies into the right position so that you can use one of your special katana moves. There are three of these: a powerful forward thrust (charged by tapping forward twice), a spinning attack that hits all enemies in a circle around you (charged by tapping either left or right twice) and a ranged slash of energy (charged by tapping back twice). By binding each move to a direction like this Shadow Warrior makes it incredibly easy for even a club-fingered clod like myself to pull them off, and so melee combat in Shadow Warrior becomes almost entirely a matter of positioning enemies so that they can be disposed of efficiently with one of these three moves. Everything else about is automatically triggered through context and is designed to make the player feel like a complete badass. For example, if an enemy is at low health and you swing the sword at the upper half of their body, Lo Wang will automatically angle the cut so that it decapitates them. If you’re holding a gun and you switch away to your sword while there’s an enemy nearby he’ll do a slash as he draws it from its sheath – which can also behead them as per the above rule. Is it realistic? Not in the least, but it’s easy to grasp, satisfying to do and looks absolutely fantastic. 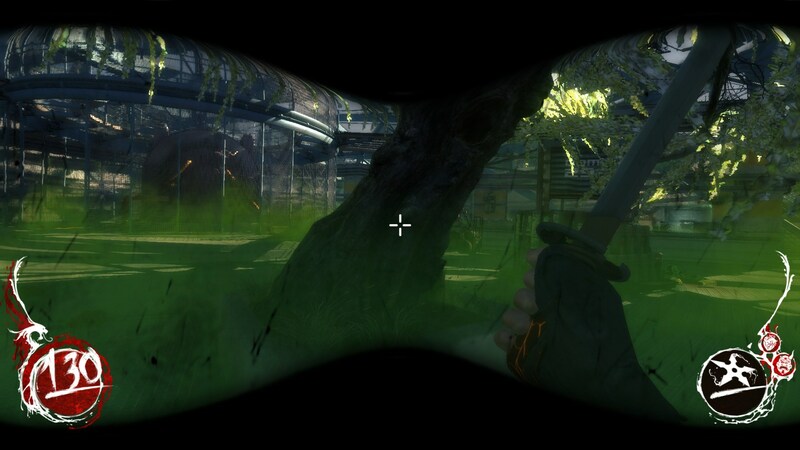 The best compliment I can pay Shadow Warrior’s melee combat is that I used the katana as my default weapon right up until the end of the game. Few games manage to pull that off. Lo Wang isn’t restricted to guns and swords, either. Every so often he finds a chi crystal which can be used to upgrade what amount to magic powers, activated through the same directional cues as the melee combat. These are somewhat more conventional, ranging from a Mass Effect-style levitate-the-baddies-in-the-air ability to a channelled healing spell that lets Shadow Warrior get away with the best of old and modern shooters; there is a health bar and it doesn’t refill on its own, but by channelling the healing spell you can always fill it up to a set point. You can also upgrade yourself so that slicing up demons with your sword heals you, which is yet another reason to engage in the melee combat. Enemy variety, while not particularly imaginative, does serve to keep you on your toes and stops you from falling into the numbing trance of cover-ironsight-shoot-cover that characterises so many modern shooters. Mechanically Shadow Warrior is a very well thought out attempt to fuse the two worlds – like I said in the opening paragraph, it’s like somebody tried to project what an old-school game would look like today if CoD hadn’t gotten in the way. Unfortunately Shadow Warrior is let down badly by its level design, which starts off just as promising as the rest of it but which veers wildly off the rails into boringville about a third of the way into the game. At the beginning of the game you’re fighting your way through nighttime pagodas and misty bamboo forests, and these are absolutely fantastic environments – the route you take through each level is pretty linear, but there’s plenty of secrets to be found if you wander a little way off the beaten track so no harm done there. It’s at the start that Shadow Warrior hits its highest notes; at the start that it manages to fit in all the best jokes between Lo Wang and Hoji, its best levels and its funnest battles. However, act two of the game takes the action away from these awesome-looking environments and entombs you inside – of all things – a sodding container ship which is all gloomy metal walls and floors. Not coincidentally this is the point where secrets dry up and the enemy design starts to run out of ideas (an enemy that charges at you and which has a weak spot on its back? I’ve never seen that done in a videogame before), and so despite the sterling mechanical work on display the battles start to become a tad repetitive. Things pick up slightly in act three, but by this point the tone of the game has turned weirdly serious – very much at odds with what had been established at the start, and not at all appreciated – and there was also one indescribably awful level where Lo Wang had to make his way through a large, confusingly laid out room filled with green toxic gas while wearing a vision-restricting gas mask. After I’d killed all the demons it took me fifteen minutes to find the exit, and that’s one element of old-school game design I can do without, thanks very much. There’s also no getting away from the fact that Shadow Warrior is a game that’s been made on a limited budget, and despite the work of a dev team that’s clearly very talented there’s only so much they can do. There’s a lot of obviously repeated level architecture, for example, and god help you if you ever venture into water because you’re liable to fall through the floor and die. There’s enough of these rough edges that it made me sit up and take notice, but while it was occasionally frustrating to fall foul of a bug or to see the same piece of level geometry for the umpteenth time Shadow Warrior has more than enough goofy charm that I forgave it. It struck me as the videogame equivalent of the Evil Dead films, in that it’s almost the perfect B-game. It’s not as polished as a mainstream shooter, sure, but then that’s precisely what it’s trying not to be. Shadow Warrior is offering you something you can’t get anywhere else: an attempt to drag old-school shooters kicking and screaming into the twenty-first century. It doesn’t quite get there, but it comes very close indeed, to the point where – like all the best B-movies – you start to wonder what these people might be able to do if they had an actual budget. That is, just so long as it isn’t the videogame equivalent of Spiderman. Ugh the gas level. Had to Youtube that one. But yeah it was refreshing fun even if it overstayed its welcome a bit. Turns out I’ve been confusing this with Shadowman. Slightly disappointed.